Pioneers in the industry, we offer beet fruit juice powder from India. Being a client centric organization, we are engaged in offering our clients Beet Fruit Juice Powder. Widely appreciated owing to its freshness, delicious taste and zero adulteration, it is processed using high quality ingredients in complained with food industry norms. Broadly consumed across the nation and packed in hygienic conditions. We offer this powder to our valuable clients at the most competitive prices. 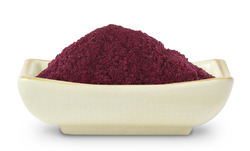 Looking for Beet Juice Powder ?